1 A None No Power Seat 1 A is a Business Class Bulkhead seat that has restricted legroom. The close proximity to the lavatories and position of the bassinet may be bothersome. 1 C None No Power Seat 1 C is a Business Class Bulkhead seat that has restricted legroom. The close proximity to the lavatories and position of the bassinet may be bothersome. 1 D None No Power Seat 1 D is a Business Class Bulkhead seat that has restricted legroom due to the presence of an entertainment equipment box. The close proximity to the lavatories and position of the bassinet may be bothersome. 1 G None No Power Seat 1 G is a Business Class seat that has restricted legroom. The close proximity to the lavatories and the position of the bassinet may be bothersome. 1 H None No Power Seat 1 H is a Business Class seat that has restricted legroom. The close proximity to the lavatories and the position of the bassinet may be bothersome. 1 K None No Power Seat 1 K is a Business Class seat that has restricted legroom. The close proximity to the lavatories and the position of the bassinet may be bothersome. 15 A None No Power Seat 15 A is an Economy Class Bulkhead seat that has extra legroom, however, the position of the bassinet may be bothersome. 15 C None No Power Seat 15 C is an Economy Class Bulkhead seat that has extra legroom, however, the position of the bassinet may be bothersome. 15 D None No Power Seat 15 D is an Economy Class Bulkhead seat that has extra legroom. However, it may have less legroom than other Bulkhead seats due to the presence of an entertainment equipment box. The position of the bassinet may be bothersome. 15 E None No Power Seat 15 E is an Economy Class Bulkhead seat that has extra legroom, however, the position of the bassinet may be bothersome. 15 G None No Power Seat 15 G is an Economy Class Bulkhead seat that has extra legroom, however, the position of the bassinet may be bothersome. 15 H None No Power Seat 15 H is an Economy Class Bulkhead seat that has extra legroom, however, the position of the bassinet may be bothersome. 15 K None No Power Seat 15 K is an Economy Class Bulkhead seat that has extra legroom, however, the position of the bassinet may be bothersome. 16 D None No Power Seat 16 D is an Economy Class seat that has restricted legroom due to the presence of an entertainment equipment box. 17 D None No Power Seat 17 D is an Economy Class seat that has restricted legroom due to the presence of an entertainment equipment box. 18 D None No Power Seat 18 D is an Economy Class seat that has restricted legroom due to the presence of an entertainment equipment box. 19 D None No Power Seat 19 D is an Economy Class seat that has restricted legroom due to the presence of an entertainment equipment box. 2 D None No Power Seat 2 D is a Business Class seat that has restricted legroom due to the presence of an entertainment equipment box. 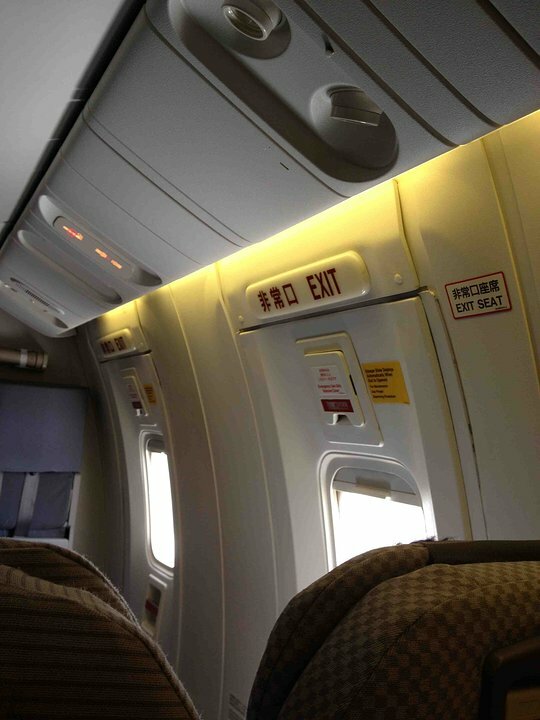 20 A None No Power Seat 20 A is an Economy Class seat that is missing a window. 20 D None No Power Seat 20 D is an Economy Class seat that has restricted legroom due to the presence of an entertainment equipment box. 20 K None No Power Seat 20 K is an Economy Class seat that is missing a window. 21 D None No Power Seat 21 D is an Economy Class seat that has restricted legroom due to the presence of an entertainment equipment box. 22 A None No Power Seat 22 A is an Economy Class seat that is missing a window. 22 D None No Power Seat 22 D is an Economy Class seat that has restricted legroom due to the presence of an entertainment equipment box. 22 K None No Power Seat 22 K is an Economy Class seat that is missing a window. 23 A None No Power Seat 23 A is an Economy Class seat that has limited recline. The close proximity to the lavatories and galleys may be bothersome. 23 C None No Power Seat 23 C is an Economy Class seat that has limited recline. The close proximity to the lavatories and galleys may be bothersome. 23 D None No Power Seat 23 D is an Economy Class seat that has limited recline. Legroom is restricted due to the presence of an entertainment equipment box. The close proximity to the lavatories and galleys may be bothersome. 23 E None No Power Seat 23 E is an Economy Class seat that has limited recline. The close proximity to the lavatories and galleys may be bothersome. 23 G None No Power Seat 23 G is an Economy Class seat that has limited recline. The close proximity to the lavatories and galleys may be bothersome. 23 H None No Power Seat 23 H is an Economy Class seat that has limited recline. The close proximity to the lavatories and galleys may be bothersome. 23 K None No Power Seat 23 K is an Economy Class seat that has limited recline. The close proximity to the lavatories and galleys may be bothersome. 3 D None No Power Seat 3 D is a Business Class seat that has restricted legroom due to the presence of an entertainment equipment box. 4 D None No Power Seat 4 D is a Business Class seat that has restricted legroom due to the presence of an entertainment equipment box. 45 A None No Power Seat 45 A is an Economy Class Exit Row seat that has extra legroom. The close proximity to the lavatories and galleys may be bothersome. 45 C None No Power Seat 45 C is an Economy Class Exit Row seat that has extra legroom. The close proximity to the lavatories and galleys may be bothersome. 45 H None No Power Seat 45 H is an Economy Class Exit Row seat that has extra legroom. The close proximity to the lavatories and galleys may be bothersome. 45 K None No Power Seat 45 K is an Economy Class Exit Row seat that has extra legroom. The close proximity to the lavatories and galleys may be bothersome. 46 D None No Power Seat 46 D is an Economy Class Bulkhead seat that has extra legroom. 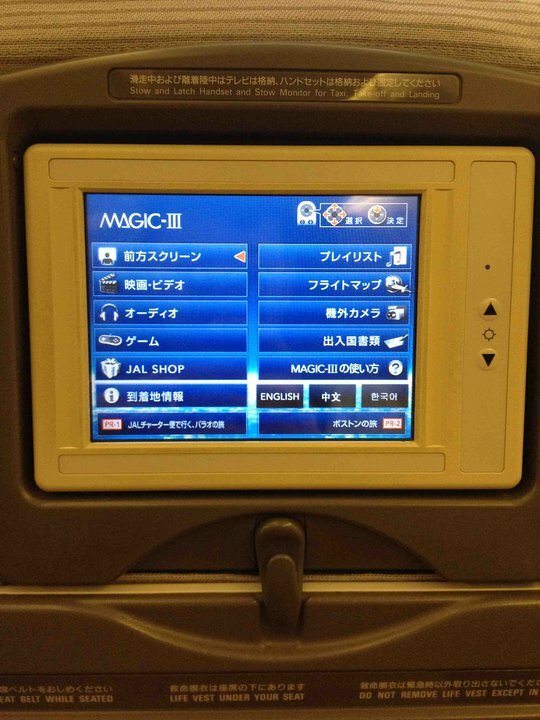 However, it may have less legroom than other Bulkhead seats due to the presence of an entertainment equipment box. The position of the bassinet may be bothersome. 46 E None No Power Seat 46 E is an Economy Class Bulkhead seat that has extra legroom, however, the close proximity to the lavatories and position of the bassinet may be bothersome. 46 G None No Power Seat 46 G is an Economy Class Bulkhead seat that has extra legroom, however, the close proximity to the lavatories and position of the bassinet may be bothersome. 47 D None No Power Seat 47 D is an Economy Class seat that has restricted legroom due to the presence of an entertainment equipment box. 48 D None No Power Seat 48 D is an Economy Class seat that has restricted legroom due to the presence of an entertainment equipment box. 49 D None No Power Seat 49 D is an Economy Class seat that has restricted legroom due to the presence of an entertainment equipment box. 5 A None No Power Seat 5 A is a Business Class seat that is missing a window. This seat has limited recline. The noise from the more crowded Economy cabin may be bothersome. 5 C None No Power Seat 5 C is a Business Class seat that has limited recline. The noise from the more crowded Economy cabin may be bothersome. 5 D None No Power Seat 5 D is a Business Class seat that has limited recline. Legroom is restricted due to the presence of an entertainment equipment box. The noise from the more crowded Economy cabin may be bothersome. 5 G None No Power Seat 5 G is a Business Class seat that has limited recline. The noise from the more crowded Economy cabin may be bothersome. 5 H None No Power Seat 5 H is a Business Class seat that has limited recline. The noise from the more crowded Economy cabin may be bothersome. 5 K None No Power Seat 5 K is a Business Class seat that is missing a window. This seat has limited recline. The noise from the more crowded Economy cabin may be bothersome. 50 D None No Power Seat 50 D is an Economy Class seat that has restricted legroom due to the presence of an entertainment equipment box. 51 D None No Power Seat 51 D is an Economy Class seat that has restricted legroom due to the presence of an entertainment equipment box. 52 D None No Power Seat 52 D is an Economy Class seat that has restricted legroom due to the presence of an entertainment equipment box. 53 D None No Power Seat 53 D is an Economy Class seat that has restricted legroom due to the presence of an entertainment equipment box. 54 D None No Power Seat 54 D is an Economy Class seat that has restricted legroom due to the presence of an entertainment equipment box. 55 D None No Power Seat 55 D is an Economy Class seat that has restricted legroom due to the presence of an entertainment equipment box. 56 D None No Power Seat 56 D is an Economy Class seat that has restricted legroom due to the presence of an entertainment equipment box. 57 D None No Power Seat 57 D is an Economy Class seat that has restricted legroom due to the presence of an entertainment equipment box. 58 D None No Power Seat 58 D is an Economy Class seat that has restricted legroom due to the presence of an entertainment equipment box. 59 D None No Power Seat 59 D is an Economy Class seat that has restricted legroom due to the presence of an entertainment equipment box. 60 D None No Power Seat 60 D is an Economy Class seat that has restricted legroom due to the presence of an entertainment equipment box. 61 D None No Power Seat 61 D is an Economy Class seat that has restricted legroom due to the presence of an entertainment equipment box. 62 D None No Power Seat 62 D is an Economy Class seat that has restricted legroom due to the presence of an entertainment equipment box. 63 D None No Power Seat 63 D is an Economy Class seat that has restricted legroom due to the presence of an entertainment equipment box. 64 C None No Power Seat 64 C is a standard Economy Class seat, however, the close proximity to the lavatories may be bothersome. 64 D None No Power Seat 64 D is an Economy Class seat that has restrited legroom due to the presence of an entertainment equipment box. The close proximity to the lavatories may be bothersome. 64 G None No Power Seat 64 G is a standard Economy Class seat, however, the close proximity to the lavatories may be bothersome. 64 H None No Power Seat 64 H is a standard Economy Class seat, however, the close proximity to the lavatories may be bothersome. 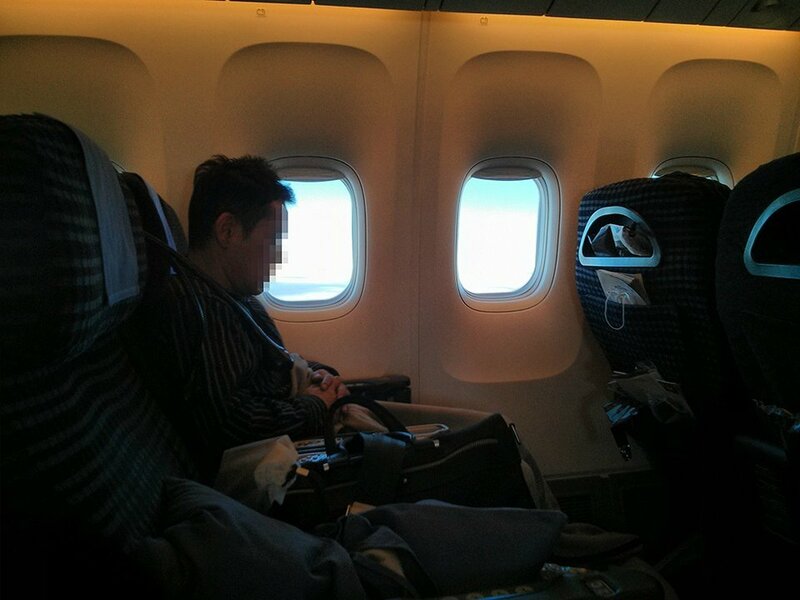 65 A None No Power Seat 65 A is an Economy Class seat in the last row of the plane that has limited recline. The close proximity to the lavatories may be bothersome. 65 C None No Power Seat 65 C is an Economy Class seat in the last row of the plane that has limited recline. The close proximity to the lavatories may be bothersome. 65 D None No Power Seat 65 D is an Economy class seat in the last row of the plane that has limited recline. Legroom is restricted due to the presence of an entertainment equipment box. The close proximity to the lavatories may be bothersome. 65 E None No Power Seat 65 E is an Economy Class seat in the last row of the plane that has limited recline. The close proximity to the lavatories may be bothersome. 65 G None No Power Seat 65 G is an Economy Class seat in the last row of the plane that has limited recline. The close proximity to the lavatories may be bothersome. 65 H None No Power Seat 65 H is an Economy Class seat in the last row of the plane that has limited recline. The close proximity to the lavatories may be bothersome. 65 K None No Power Seat 65 K is an Economy Class seat in the last row of the plane that has limited recline. The close proximity to the lavatories may be bothersome. 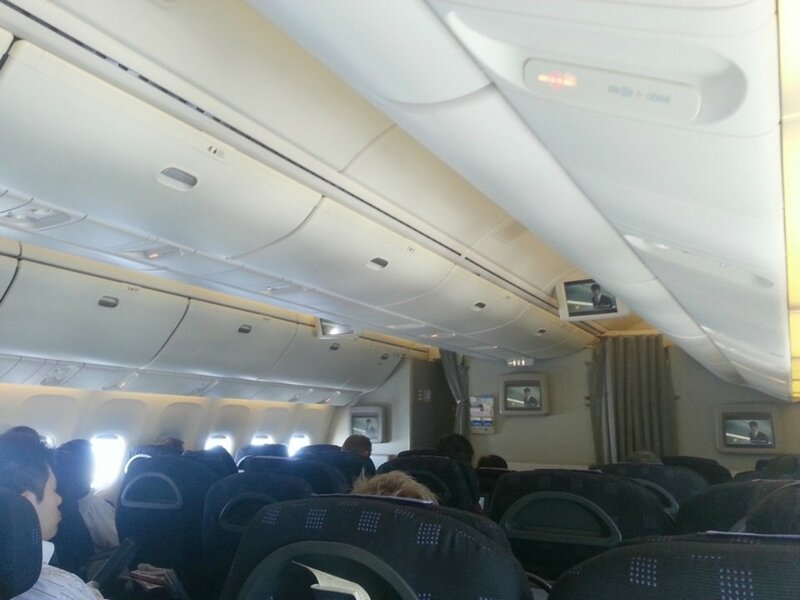 This version of the Boeing 767-300ER (76W) seats 237 passengers with 30 of these seats as Business Class seats. This aircraft is primarily used on International routes. The 767-300 is capable of being flown by a two-person cockpit crew through the use of system automation features and digital technology. This aircraft is 21' feet longer than the 767-200, and is used on domestic and international routes. All D seats have entertainment equipment boxes underneath the seat in front, slightly restricting legroom. 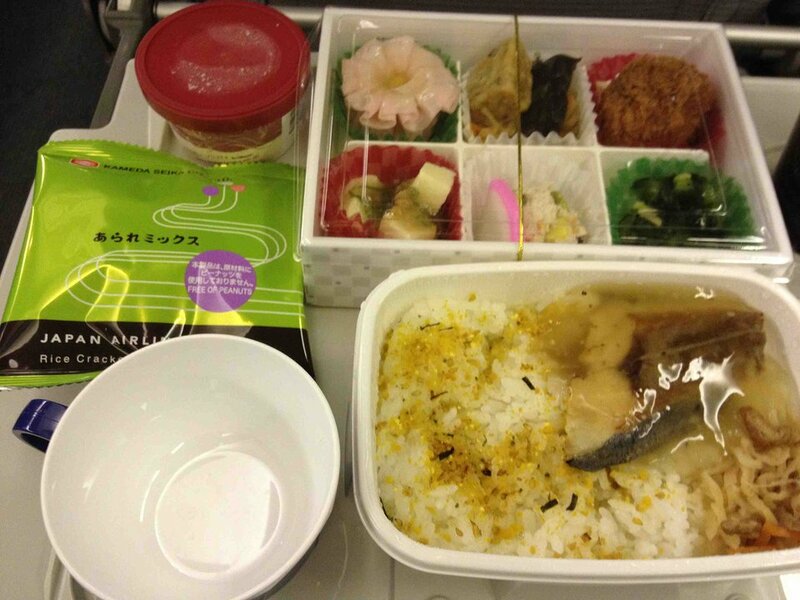 Japan Airlines is loosing its edge. seat was dirty and reclining did not work. Meal selection somewhat interesting. 8 am departure offered a terrible bad steak. Staff was very pleasant and tried to help. Will fly ANA next time. Standard exit row seating with tray in arm rest. More legroom than anywhere else on the aircraft. Only negative could be the proximity to the galley. The line to the lavs was a non issue.